Challenging probability problem (AMC 12B Problem 18) - Are the AoPS solutions incomplete/wrong? A frog makes $3$ jumps, each exactly $1$ meter long. The directions of the jumps are chosen independently at random. What is the probability that the frog's final position is no more than $1$ meter from its starting position? This problem comes from the AMC $12$ in the year $2010$. The contest is an invitational test in the US for secondary school to qualify for the Olympiad. It involves $25$ questions in $75$ minutes and problems can be solved without calculus. I didn't get very far in my attempt, so I ultimately searched and found contributed solutions on the Art of Problem Solving. I don't understand "solution $1$" and I am pretty sure "solution $2$" is incorrect. The AoPS solution states "it is relatively easy" to show exactly $1$ of these has magnitude $1$ or less. If so, then out of $4$ possible options, there would be $1$ with magnitude $1$ or less, so the probability would be $1/4$ (the corrrect answer is indeed $1/4$, but this method does not satisfy me yet). I did not understand this step, and someone asked the same question in a previous thread. It's not obvious to me, and I have no clue how you would go about showing this. Is there an inequality that will help? I don't see how to simplify it. Also the official solution is much more complicated (see sketch below), which makes me think this solution is either elegant and overlooked or it is coincidentally the correct number but not the correct method. The solution goes like this. Suppose the first jump is from the origin. So to be $1$ unit from the starting point, you need to be in the unit circle. The next two jumps can be $2$ units after the first jump, equally likely to be in any angle. So the sample space of ending points is a circle of radius $2$ centered at the point of the first jump. This circle is also tangent to the unit circle. Thus the sample space has an area of $4\pi$, of which the area of the unit circle is $\pi$. Hence the probability is $1/4$. I am pretty sure this method is incorrect because I simulated $2$ jumps numerically. You do get a circle of $2$, but not all points are equally likely. There is clustering to the center of the circle and the circumference of the circle. Plus if this method was true, it would seem that $3$ jumps should be a circle of radius $3$, but that would imply a totally different answer of $1/9$. The idea is to set coordinates so the first jump is $(0, 0)$ and the second jump is $(1, 0)$. Let the starting point be $(\cos \alpha, \sin \alpha)$ and then the location after the third jump is $(1 + \cos \beta, \sin \beta)$. It is not too hard to work out the condition for the third point to be within $1$ unit of the first point. Ignoring the measure $0$ cases of $\alpha = 0$ and $\alpha = \pi$, we need $\alpha \leq \beta \leq \pi$. We can limit to $0 \leq \alpha \leq \pi$ since the other half works out the same by symmetry. And we have $0 \leq \beta \leq 2\pi$. Considering a rectangle $(\alpha, \beta)$ where all angles are equally likely, the sample space is the rectangle of area $2\pi$. The event to be within 1 is a triangle with area $\pi/2$, so the desired probability is $1/4$. Are the AoPS solutions incomplete? I would love if their "solution $1$" is correct as it's much easier to compute and it be more reasonable for an average time allotment of $3$ minutes/problem. I run the YouTube channel MindYourDecisions, and am considering this problem. If I make a video I'll credit anyone who offers helpful answers. I searched the problem on AoPS, and found this thread from 2016. The solution by Zimbalono there (post #13) is worth looking at as well. The last figure probably calls for some more explanation, but it's pretty good overall. WLOG, let $a=(1,0)$. Then, since $\|b\|=\|c\|=1$, the vectors $b+c$ and $b-c$ are orthogonal. This means the four points $a+(b+c)$, $a+(b-c)$, $a-(b+c)$, and $a-(b-c)$ form a rhombus centered at $(1,0)$. This rhombus has side length $2=2\|b\|=2\|c\|$. 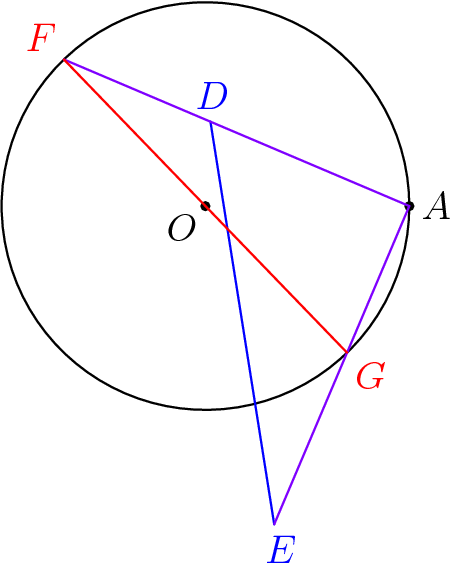 In generic position (with probability $1$), one of each of the pairs $\pm(b+c)$ and $\pm(b-c)$ point inward from $(1,0)$ with negative $x$ coordinate, and one each point outward. 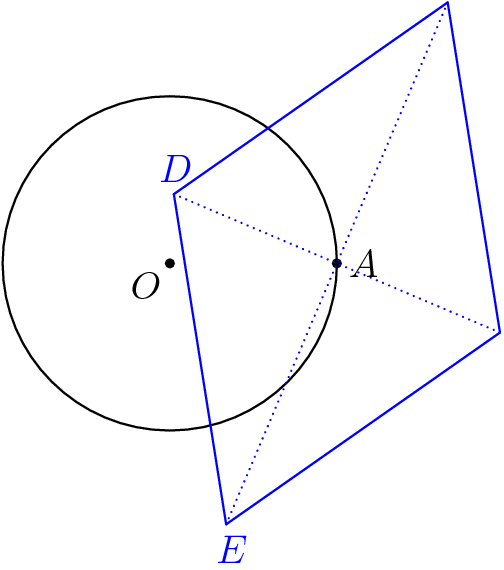 We claim that (aside from a probability-0 case that puts both on the circle) exactly one of the two inward vertices of the rhombus lies inside the circle. Now we have two right triangles with the same hypotenuse length and the same right angle. Going from the one with vertices on the circle to the one that shares vertices with the rhombus, we must lengthen one leg and shorten the other leg. The lengthened leg pushes its endpoint outside the circle, while the shortened leg pulls its endpoint inside the circle. We have one vertex of the rhombus inside the circle, and we're done. My figures were done in Asymptote - code available on request, if you want to tinker with things. I have just arranged a given soultion(The official solution). Not the answer you're looking for? Browse other questions tagged probability contest-math or ask your own question.